Many Congratulations to Progressive Democratic Party (PDP) on your name and logo change. We hope all is well within the party.We sincerely meant well with the felicitations to all of you in BN/PDP. However,we were very much taken aback together with many of Mawans staunchest BN supporters when these words were uttered,” “sama ada saya menunggu dia atau dia menuggu saya( untuk permohonan sebagai ahli),kalau benar-benar berminat..pohonlah. The matter of Mawan to be in PDP ‘new member’ does not arise in this situation to be chosen as a candidate. He was a former President of SPDP where he helmed for 10 years. He has left SPDP but he has stayed very loyal as a TRUE BLUE BARISAN MAN and has never wavered from the stance. Rest assured we know, it is within the PDP democratic right to choose a candidate of their choice to represent the party in the forthcoming GE14 for P205. One can loudly claim that the ‘seat’ belongs to the party but one must not take out the fact that its the BN hierarchy that decides the winnable,loyal and can deliver the seat to BN. In this Saratok seat one must be reminded that Mawan is still the sitting and incumbent BN MP. PDP can lay claim to the seat and wanting the “quota” but one must take note that the BN Hierarchy is not about to give this seat “Saratok” away on a platter to the opposition. Mawan has kept the BN “fortress” intact and has been very people-centric and for the opposition to penetrate and capture Saratok it only needs to dislodge Mawan from being named the BN candidate. The mountain would have being removed and it would be plain sailing against an untested potential PDP candidate. One can argue that the so called “potential” is the rightful choice of the party but BN knows the implications of losing this “rural parliamentary seat” The state seat of Krian is an opposition PKR stronghold and BN knows that only too well. PM Najib and DPM Zahid have echoed their wants to all political leaders and parties and the call must not be taken lightly. “its not business as usual unlike the previous elections for BN and selfish agendas must be left aside for the greater good. Will BN chance it and give it to an untested potential candidate and lose the seat? It certainly would not look good too on the CM on his maiden election outing. CM is in the know that Mawan has worked the ground tirelessly and is very well accepted by the people of Saratok. The 2 BN ADUNS have worked closely together with Mawan and they are very comfortable and supportive towards him. PM himself was at Mawans first foray in Saratok when “all odds” were against Mawan. Mawan delivered and is still carrying the BN flag serving the constituency well and PM will take all these into consideration. PM himself was on the ground morally and politically supporting Mawan to ensure that he pulls through in 2013. The above was in 2013. Today, BN in Saratok is more than comfortable as they have made up much grounds in delivering to the people with Mawan at the helm. Mawan is very much the BN Incumbent and until the dissolution for the next GE14 he carries the BN Flag on his shoulders. There are many factors in play in the “crucial”seats and BN HIERARCHY will obviously not leave everything to chance by disregarding Mawan’s contributions as a Parliamentarian. It is understood that PDP is doing all these to raise the morale of party supporters. The feel good factor and big hoo-haa at the party level does not necessarily equal to winning the confidence of the people and the voters. The party need to be realistic and listen to the ground and feel the pulse of the people.It is not wrong for any political party to stake claims on seats or quota. Ultimately the decision will be from the Prime Minister and Chief Minister of the State who will above all make sure BN wins all the seats they contest. There is still a chance as always in Reconciliation and BN hierarchy will find a COMMON GROUND for all parties concerned as they head into GE14. The President of PDP Tiong have finally been ‘smoked out of his fox hole‘ by the interview conducted by Borneo Posts Peter Sibon. This is a political decision which PM Najib himself would and could easily advised Tiong,”the quality of decision is like the well-timed swoop of a falcon..” However,Najib knows that Tiong is very much in a hurry to wrap up this “imbroglio” and informed his colleagues in BN that all is under control. He himself is not 100% safe and looking over his shoulders in Bintulu or else he would not have talked about delineation exercise. We know that he won in 2013 with voters of 26458 against DAP John Brian Anthony garnering 19025. Meanwhile audie61 made two separate phone calls one each to Paul Igai and William Mawan. Paul said its a ‘missed opportunity for reconciliation” as the momentum was there after the Pahang BN retreat. The PM had said in so many words that on Mawan’s case it had to be done ‘fast”. When questioned further on Tiong ‘s statement he gave a positive answer as ‘all is not lost” He also mentioned that Mawan would be welcome back with open arms and will not be dropped as an incumbent. Of course Paul knows very well what transpired too in the last state elections when Mawan was fielded as a direct BN candidate. He also told us that there are too many ‘piranhas” swimming around and lurking around the President. If we read it politically PDP would not want this seat to fall to another BN component party. They have every right to claim the traditional seat and the press release is a strong enough statement to justify . ‘I am serving both the people in my constituency and am more interested in getting down to the grassroots than doing petty politicking. I have been elected to serve and am doing just that. The interest of Barisan Nasional is more important as we approach the GE14 and he said that he is so “entrenched in Saratok” that he will not take a step backward. His main task is to consolidate all the groupings that exist in Saratok and to ensure that seat remains BN after GE14. We were informed by our reliable sources that PDP President Tiong has been misinformed and illadvised on the situation on the ground. Mawan said ,’its up to Tiong to camp in Saratok for week or so and find out for himself instead of listening to hearsay’s which will do no good to Barisan Nasional.” He should come unnoticed quietly and he will know the real situation on the ground. Did Tiong make the effective decision and timing or will Tiong live to regret his actions? Tiong knows the final say will rest with the State BN Chairman Abang Jo and PM Najib as the BN Chairman and for them to Sacrifice “WINNABILITY WITH LOYALTY” with a new and untested candidate is not exactly on their menu. PM and CM will not want to go on the back foot and knows that Mawan will deliver the seat when called upon. PM himself came down in 2013 when Mawan was at his lowest peak and he campaigned for Mawan to sail through against a “worthy opponent” in Ali Biju of PKR and other detractors who were hell bent of destroying and finishing off the then SPDP President. It was supposed to be an Iftar@KL 2017 programme at Dataran Merdeka. The political journalist and those who know Minister Nazri Aziz well enough were waiting for the perfect timing. They got it spot on bang,bang bang and he shot everything that came his way. When pressed further he even had a go at Miri,”On the city of Miri’s opposition towards the tax, “Miri only has one hotel”. Wow, he even went further like a man possessed on a witch hunt on the byelection of BN’s chances in Pujut. Surely, this must have gone very well with BN Sarawak’s component parties and they will even lay out a RED CARPET TREATMENT for him to campaign for them. Karim Hamzah does not want to aggravate the situation further and he was very magnanimous in his reply when asked by reporters in a programme “bubur lambuk”organised by the Island Big Bikers in Kuching Sarawak. Is that wrong ? The bill as shown here extracted,” Tourism Tax Bill was introduced on April 4 and passed in the Dewan Rakyat a day later. Dewan Negara duly passed it, too, on April 27. Can it be delayed instead of being enforced by July 1st? Certainly in a democratic country the Prime Minister and his cabinet could be consulted again and deliberated on the table and that was what our newly appointed Sarawak tourism Minister was hoping and asking for. Instead Karim got a tongue lashing and many are questioning Nazri’s agenda now? Is he doing it on purpose to show his mettle as someone very big and powerful within UMNO circles or is he doing for someone else across the political divide? We dont want to assume or else we too will get heavy “bombardments” coming our way. Even now Fadillah Yusof PBB Youth Chief and Rahman Dahlan have come under attack when they are protecting one of their own. Nazri even have the cheek to say they are not ‘neutral” as they are both East Malaysians. Isn’t this going to blow over with now Sarawak pulling out its representation in the Malaysian Tourism Board in which the Minister of course is Nazri Aziz. This political statement comes a day after the spat between Nazri and Karim. Nazri also thanked the Sarawak government for pulling out and thats real “political sarcasm” on his part. A political analysts just wants to touch the cream on top and said,”Federalism throwing their weight around as Sarawak’s Tough man the late CM Adenan is not there to rally the people and take the flak himself. Our source said Nazri himself will not be afraid to go in the ring with anyone but he did and does fear CM Adenan. Is that the reason why he sees Karim Hamzah as a late upstart and “wet behind the ears” and even named him “Setahun Jagung” Many entrepreneurs are now capitalising on the Setahun Jagung term and have called their burger ANC SetahunJagung. Drinks ice kacang with Setahun Jagung,T shirts are also being made. This political spat will and are a windfall for some people who knows how to cash in. Social media is abuzz and love him or hate him the Tourism Minister has waded into the battlefield and got on with his work. Nazri’s agenda will only surface long after he is gone. But it will do no good to Sarawak or Sabah if its already in full implementation. Sabah Tourism Minister Masidi Manjun have also joined in the chorus of agreeing with Karim and even PRS Youth Chief and Assistant Minister Snowdon Lawan came out to openly support . Nazri as a senior cabinet Minister should not have reacted the way he did and he was Overheated in his responses which will have a detrimental effect on the Tourism Industry. Anyway,Politics is interesting at the best of times when the right subject matter surfaces. Within the next six months there will be an EVOLUTION of some sort within the local political minefield. The leaders who are in power at the moment does not necessarily be contented with their seats nor their powers. We have mentioned to many within the political corridors that there are far too many ‘RATS” who are overstepping their boundary lines. Of course, one would say,” NAME THEM ,NAME THEM,NAME THEM.“. Do we need too ? Dont think we are that “Daft or stupid” ? The Pied Piper is coming up with his “magic tune” very soon. Oh No, Ooops I did it Again..
Collaquial terms such as ‘Orang Malaya’ must be understood in the right context. People with a different frame of reference and the intellectual incapability to appreciate the social framework of such a term ‘Orang Malaya’ have no moral right to condemn me for my post on the “Orang Malaya’ tag. 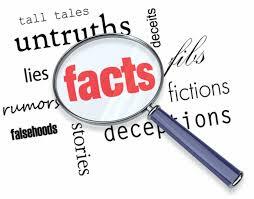 The vile and baseless accusations is a deep reflection of their low-life mentality, ever ready to lash at their perceived enemies for anything which does not meet their royal agenda. Having been in the political landscape for decades, I have deep insight as to the goings-on and naturally have immovable patriotic allegiance to my beloved country. To associate me with Sarawak Report is another indication of the deep jealousy of my detractors, for their juvenile postings have never seen the light of day in mainstream media or top news sites. My humble suggestion is for those writer/s to attend college and take Malaysia Negaraku 101 to be better acquainted with the nuances of geographical differences in semantics, pertaining to ‘Orang Malaya’. But then again, for such servile creatures, this post is way above their heads. Still I write from my heart with a clear conscience knowing I had none of those despicable intentions as maliciously alluded by those delinquent writers. Regardless, my zest for GE 14 and the next state elections remains undaunted because I love Sarawak, my beloved state and Malaysia, my beloved nation. No one trying to deride me can take that allegiance and love I have for my beloved country. When it comes to religious matters I will not pull my brakes. It is because of my upbringing and which has been drilled in by my grandfather to my dad and mum. We respect each and everyones religion and there is only one Almighty GOD says my granddad to me when I was 10 years old in Mukah. Always don’t use religion to score points in whatever debates or arguments you are involved in says my mum and dad. How I hate bigotry and religious extremists till today. I will not hesitate to raise my fists and land a right and left “hook” when its necessary. Even in the Catholic Faith I speak my mind when some of them act out of line and are seem to be “RELIGIOUS BIGOT“. Those who practise religious fanatism should look themselves in the mirror and then slash their wrists and see whether the “blood” that flows is green,black,orange,yellow or white. Sarawak Land Development Minister Tan Sri Dr James Masing has put the stop order on the distribution of Catholic weekly Herald in Sabah to Home Ministry officials making decisions in haste without consulting their political leaders. “They have obviously taken matters into their own hands. I suggest that political leaders must be consulted first before taking action on matters which has negative socio-political impact. “It is us, the politicians, who will bear the brunt of criticisms, not these government officers,” Masing, a senior Christian minister in the Sarawak cabinet and also president of Parti Rakyat Sarawak (PRS), pointed out. 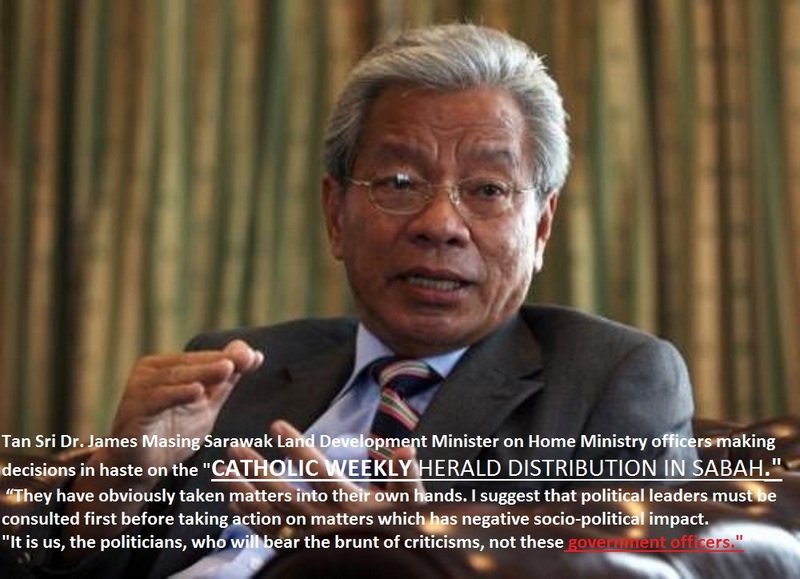 Masing said this today immediately after Herald editor Father Lawrence Andrew announced that the Home Ministry had given its clearance for the 2,000 copies of the Catholic weekly to be distributed after its officers at the Kota Kinabalu International Airport on Thursday had stopped it. The 2,000 copies of Herald were meant for distribution to about 20 Catholic parishes in Sabah. Andrew said the Home Ministry had informed the forwarding company this morning that Putrajaya had cleared the weekly for distribution. However, today being a non-working day, the forwarding agent was unable to get the copies out to the churches in time for Sunday services. “It will be distributed from tomorrow, but then Catholics go to church today,” Andrew said. He added that the Home Ministry should explain its action. Tuaran MP Datuk Wilfred Tangau hoped that such actions would not recur as incidents like these only cause unnecessary anxiety among the people of Sabah. After the Catholic weekly’s right to use the word Allah was overturned by the Court of Appeal on October 14, Putrajaya assured East Malaysians that they could continue using the word in their worship and publications. It was seen as an effort by the Barisan Nasional government to ensure it keeps its key vote bank in both Sabah and Sarawak where there are many Christians who worship in Bahasa Malaysia and indigenous languages which also use the word Allah. The Catholic Church prints 14,000 copies of Herald every week for about one million Catholics in the country and Herald editor Andrew said Allah was used in inverted commas in the latest edition when referring to the Court of Appeal ruling on October 14. Minister in The Prime Minister’s Department Tan Sri Joseph Kurup had also earlier today said he believed the authorities stopped the publication from being distributed due to a “miscommunication”. Prime Minister Datuk Seri Najib Razak had said the Court of Appeal ruling that ban the Herald from using the word Allah in its publication, is not binding in Sabah and Sarawak. Even Attorney-General Tan Sri Abdul Gani Patail had said the Court of Appeal decision was confined to the publication of the Bahasa Malaysia section of the Herald and the court had held that the Al-Kitab and the Herald are two publications of an entirely different character. The Al-Kitab is the Bahasa Malaysia/Indonesia version of the Bible and is widely used in churches in Sabah and Sarawak. PKR Sarawak assemblyman See Chee How in hammering the government’s assurance said “credibility is just not in their vocabulary”. Datuk Dr Thomas Tsen, president of the Sabah Council of Churches, in his reaction to the seizure said “its just very shocking, saddening and very disappointing”. – October 27, 2013. Nobody is above the law. if there has been overzealous reporting or “usually they say misquoted statement” there must be a FOLLOW-UP Press release. In this case the Acting Police Chief has come out strongly to defend himself. After reading the extracted article below netcitizens and bloggers would have a clearer picture. IS THERE ANOTHER STING IN THE TAIL? Selangor acting police chief A Thaiveegan has denied stating that the police would use the Sedition Act against those who spread photographs with regard to the shower room canteen imbroglio. In a Sin Chew Daily report, Thaiveegan (right) claimed that he was misquoted by a “certain newspaper”. According to the police chief, he had not said anything to the effect of using the Sedition Act. Yesterday, Utusan Online (below) reported that Thaiveegaan in stating that those who spread the photos could be investigated under the Sedition Act, warned that such images could result in provocation and racial conflict. “Police would not hesitate to take action against those found spreading seditious information about the school over the social network,” he was quoted as saying. A check on Utusan Online today revealed that while the URL for the online article still carried the original headline regarding Thaiveegan’s threat, the content has however been replaced with an unrelated story. The pictures of non-Muslim children of SK Seri Pristana having their meals in the shower room during the current fasting month have been posted on various social networks over the past three days, and have angered netizens. Images uploaded on Facebook on Monday show the pupils sitting around tables set up in their school’s shower room. The school authorities have been accused of forcing the children to eat in the makeshift dining room, located next to the toilets. However, it was later reported that the school canteen has been closed for renovation while Deputy Education Minister II P Kamalanathan denied that the matter was related to race or religion. BN Kalah"Over My Dead Body"
PM "Thank You for Your Assurance"